Cryosurgery, or cryotherapy, is a procedure that involves extreme cold being applied to destroy abnormal or diseased tissue. The surgery is not invasive, virtually painless, and now offered by some veterinarians. Doctors have been using “liquid air” to treat skin conditions throughout the 20th century, which eventually led to various methods of cryosurgery that have been proven and refined. The procedure has been used to treat a broad range of conditions in both people and animals. Cryosurgery provides a quick and highly effective solution for removing small masses and treating distichiasis. The procedure can usually be performed during your normal office visit. The application is mostly done with a handheld device that sprays nitrous oxide directly to the affected area of the skin. 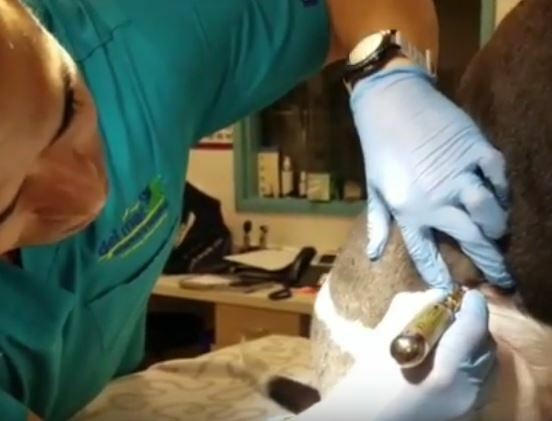 Veterinarians have successfully treated dogs, cats, horses, ferrets and even birds with cryosurgery. The results speak volumes and the risks are minimal, especially when compared to traditional methods of surgery. The cost for cryosurgery is also very affordable when compared to traditional surgery because anesthesia and normal sterile preparation aren’t usually necessary. If you see a suspicious lesion or growth on your pets, please don’t wait to ask your veterinarian for an assessment.